Today we woke up and made our way to China town! 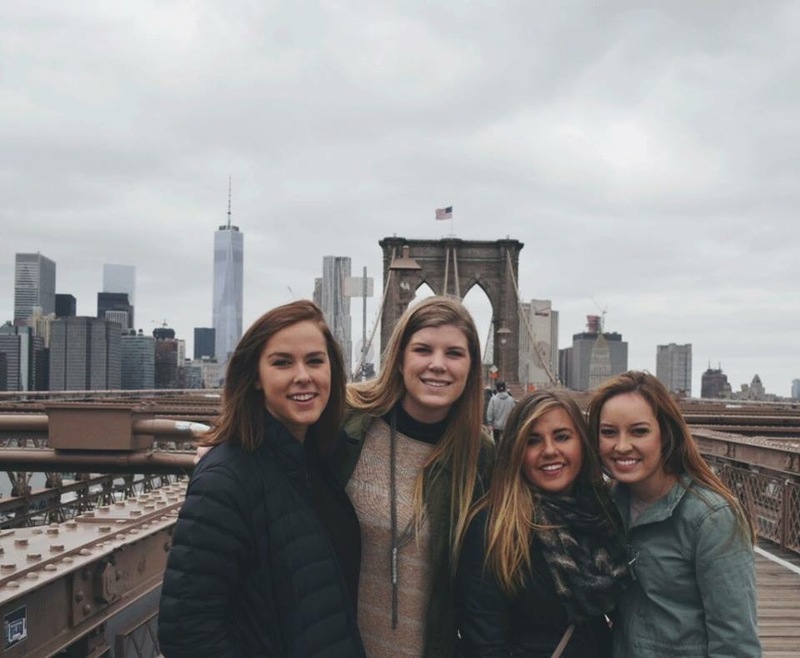 We took a subway to Brooklyn and decided to walk across the Brooklyn bridge. It was amazing walking across the bridge closer to the Manhattan skyline with Frank Sinatra singing New York, New York in my head. We made it to China Town then wandered into Little Italy. It reminded me of being in Italy I loved it! I then left to try to catch up with my Aunt and Uncle and three young cousins in Chelsea at the pier. 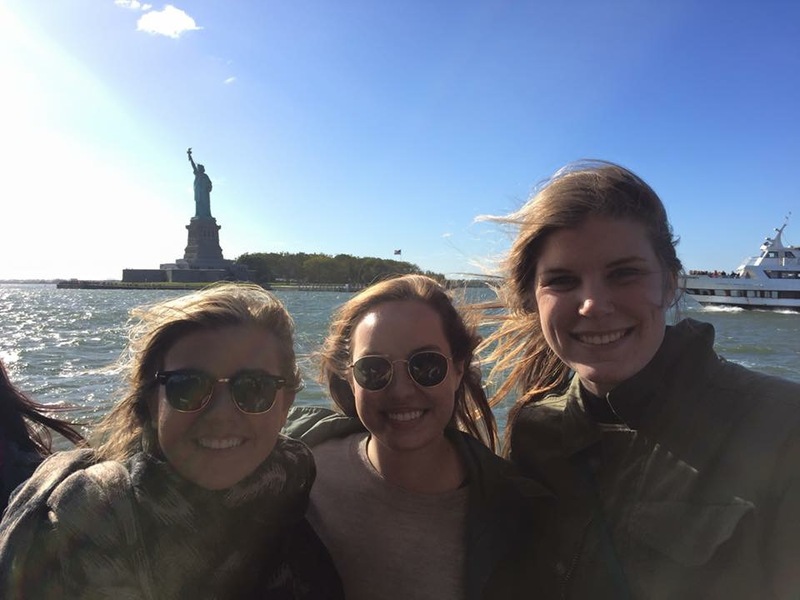 Then we met back with the group and went on a boat tour around Manhattan island! It was beautiful. It was awesome to see Manhattan from a distance. Basically, I love New York. Our first day in New York consisted of lots of walking, of course. We were responsible for getting ourselves to The Met by 10, so of course all the girls arrived at 10:30. 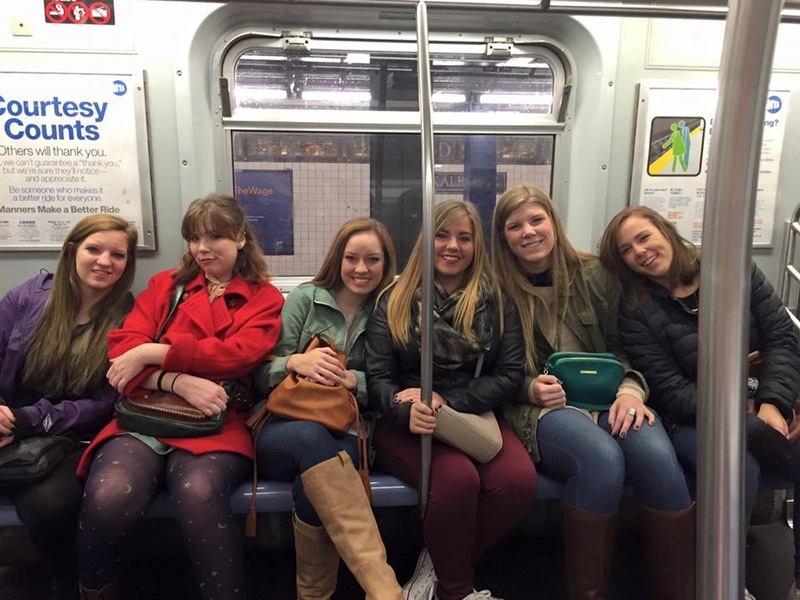 Using the subway system with 12 girls that don’t really know what we’re doing is very stressful. But we made it and got to explore The Met for a few hours before a walk through Central Park. There are so many movie sites in Central Park. We walked past the boathouse from 27 dresses, the pond from Stuart Little, and we passed under so many bridges that I know we’re in other shows and movies. 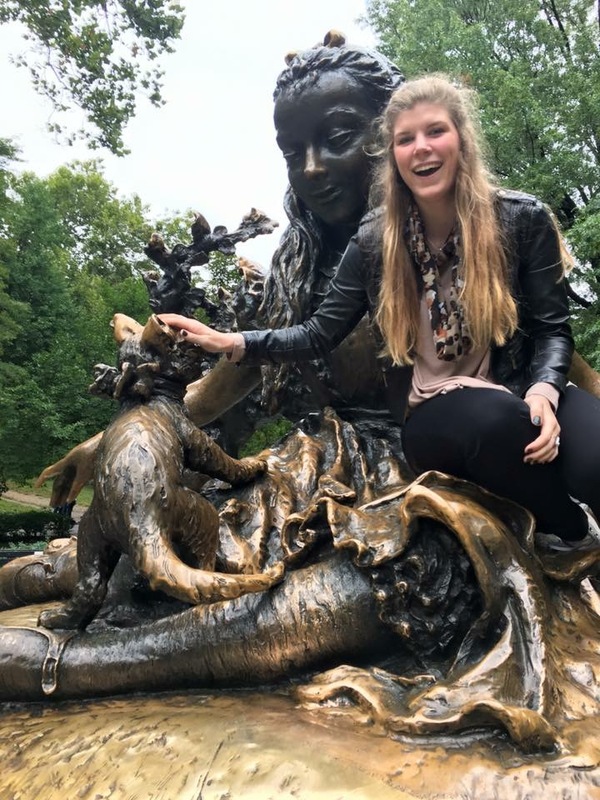 We stopped at an Alice in Wonderland sculpture to climb and take pictures. Of course I found the cat on the sculpture. After our walk through Central Park, we met at the Guggenheim Museum. Then we broke and a few of us went to grand central station. It really is an amazing place. There are constellations illuminated on the ceiling and several shops and restaurants. I kept picturing how it must have looked in the roaring 20’s. My favorite decade in my favorite place. Once we found our way back to Bushwick, it was time for a graffiti tour. 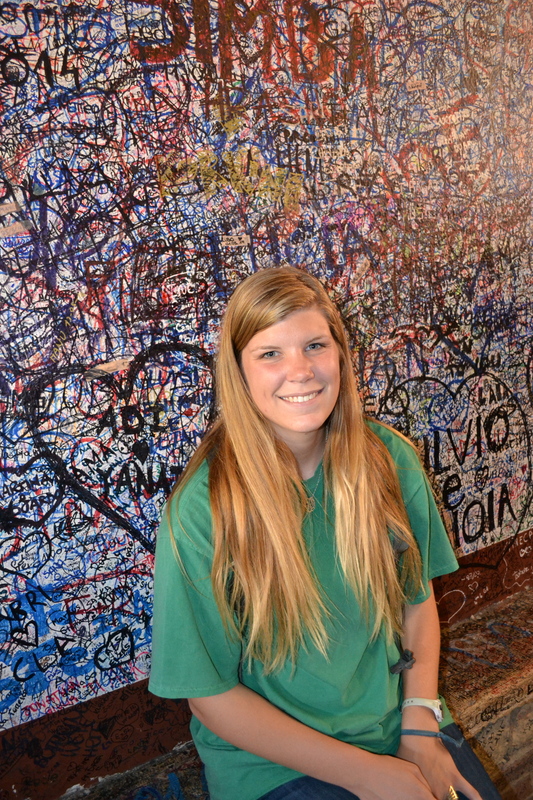 Who knew there was so much to learn about graffiti?? There are different styles and names for every kind. When someone just writes their name it’s called a tag. The style of graffiti has developed into large works of art. Graffiti artists keep their identity hidden because it was against the law. But being arrested was also part of it. Now you can get a permit or remission from a building owner. After the graffiti tour it was time to find food and a place to watch some football! 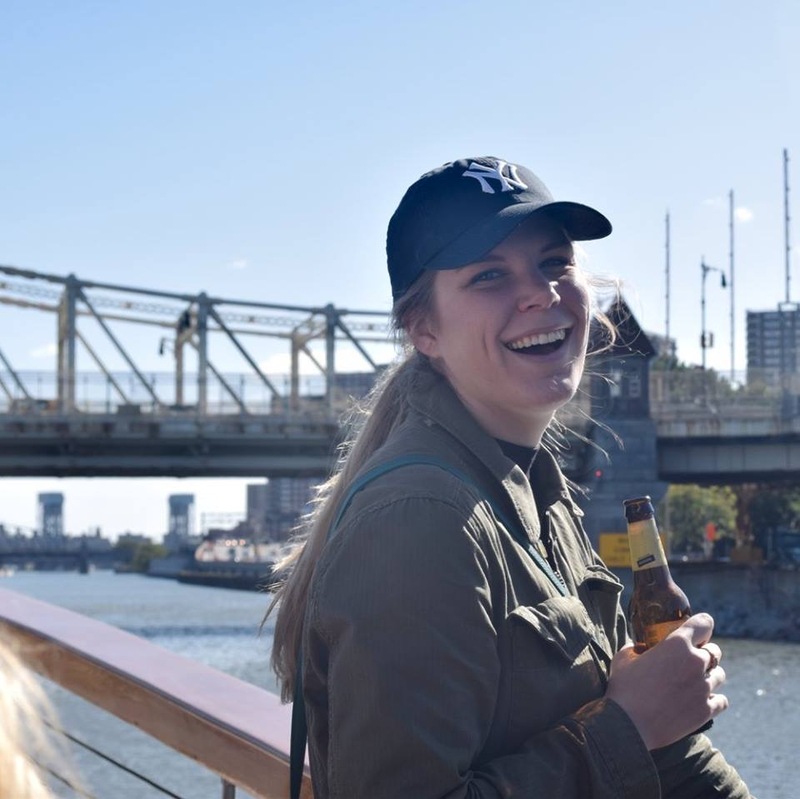 We walked around Bushwick for what seemed like forever and stumbled upon a great burger place! So we ate in our jersies then went back to the basement bar for another crazy performance. And I’m off once again, this time to New York City! (My favorite place in the world) What’s there not to love? 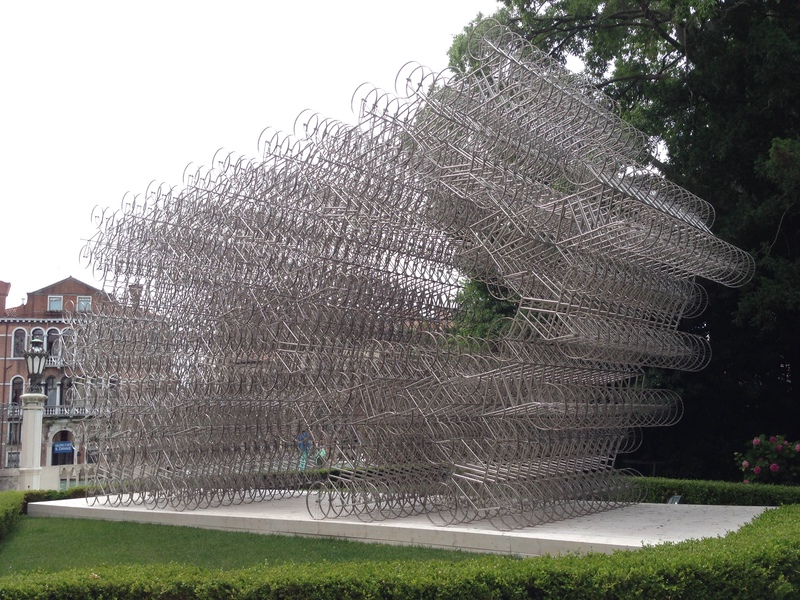 You can get a hotdog off the street, the best bagels in the world, and visit unlimited art galleries and museums. I did all three while we were there! 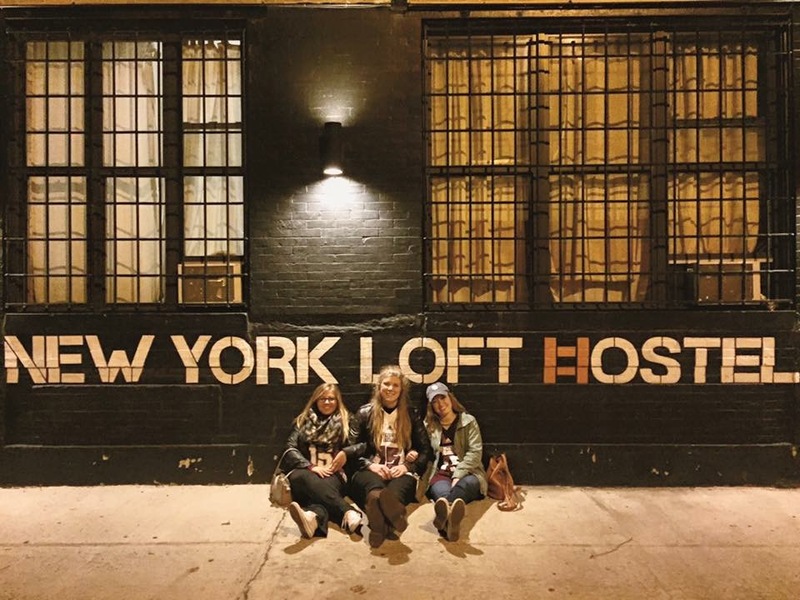 We stayed in a cool hostel in Bushwick called the New York Loft Hostel. It was a neat experience. I’ve stayed in a hostel before, but it was my first one in America. There was a bar below it called The Basement Bar and they had bands or events going on every night. The night we got there we went after dinner and watched a guy name Honeychrome. It was awesome. Google him, right now. My first meal in New York was sushi, of course! And it was absolutely delicious. But after traveling, and sushi, and Honeychrome, I was ready to sleep. We made it back to our rooms and quickly fell asleep, besides the fact that our room was freezing. 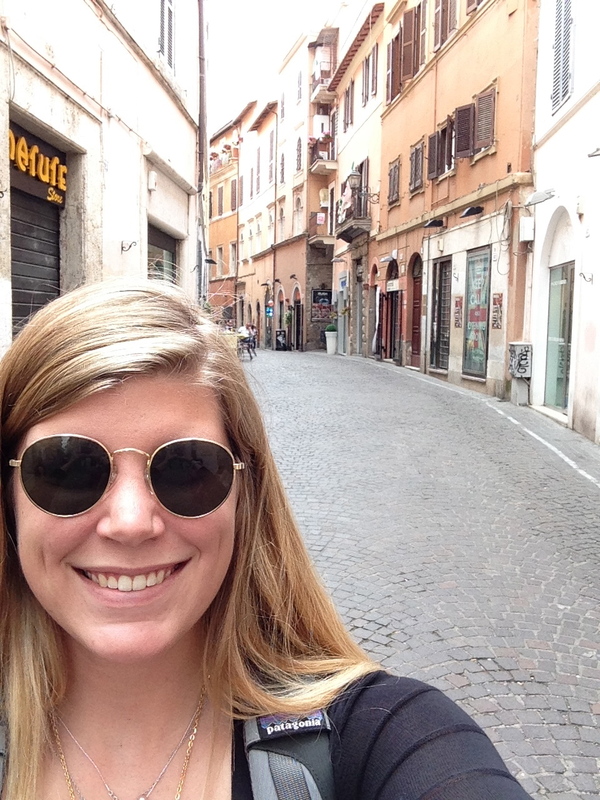 I have made a home away from home in Trastevere, but I’m excited to be back in America with my family, friends and Sam. These will be memories I’ll always cherish! SO SO sorry to everyone. Once again, I didn’t realize this didn’t upload a few days ago. Wifi can be a little spotty. Jordan: Oh, cool! I’m from Memphis, Tennessee! Guy: Is that in Germany? Somehow, in the midst of the excitement, we became friends with an Italian bar owner of a bar nearby. We ended up talking to him about culture in Italy versus culture in America. 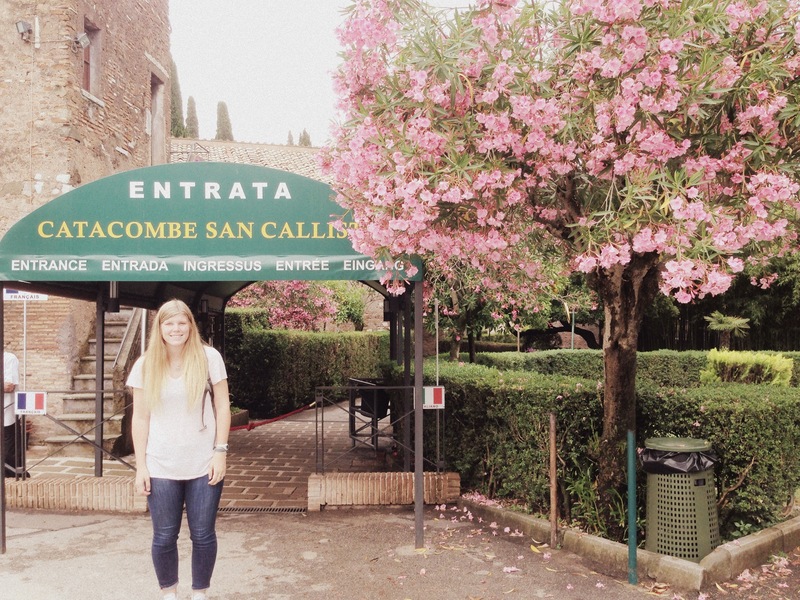 I read a few things on Italian culture before I came on this trip, but it was extremely interesting to hear it first hand from someone who has experienced it. In that one conversation, I gained a greater respect for the country I’m in. Of course I love Italy, and I know it’s an amazing place, but to hear how both Italy and America are perceived by an Italian is pretty eye opening. In a country thats only the size of Texas, it is more intricate and packed with more history than all of America. That’s something else I’ve grown to respect is the history. America has a lovely history, but compared to Italy, we are a young country. The catacombs were a refuge for Christians from prosecution. False. Although burial grounds were, by Roman law, sacred and would have been the perfect refuge, this was not the case. To begin constructing a catacomb, a permit was needed by the city government and from the landowner. Also, the millions of bodies were left unpreserved, so just imagine the rotten stench. It would by physically impossible to survive in that condition. Christians conducted secret religious services in catacombs. False. Although Christians did gather here, they did it at their own risk. It wasn’t completely a secret. The Roman law that burial grounds were sacred was what protected them. Christians held these services in private homes. The small chapels in the catacombs were used for small funerals. We had a few rainy days that I couldn’t have been more thankful for. 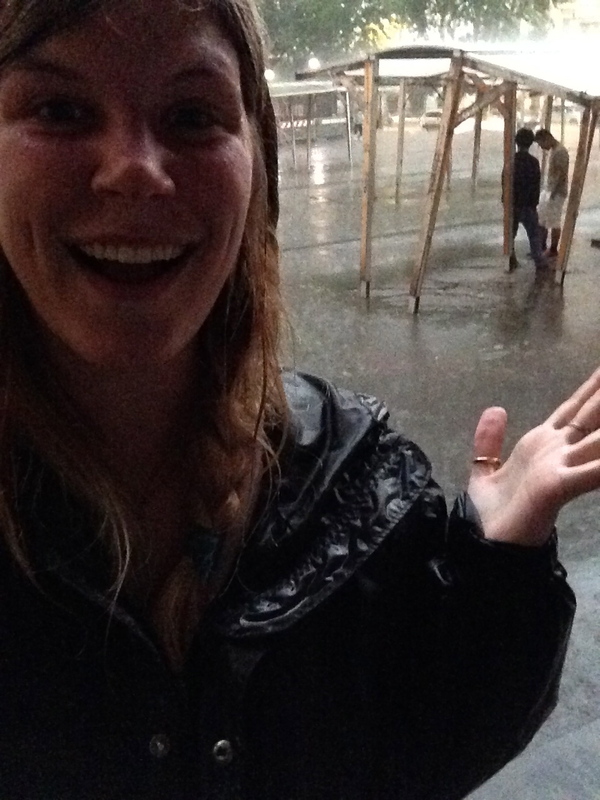 It had been so extremely hot that when it finally started raining, I just stood in it (with a raincoat of course) and enjoyed not being hot. 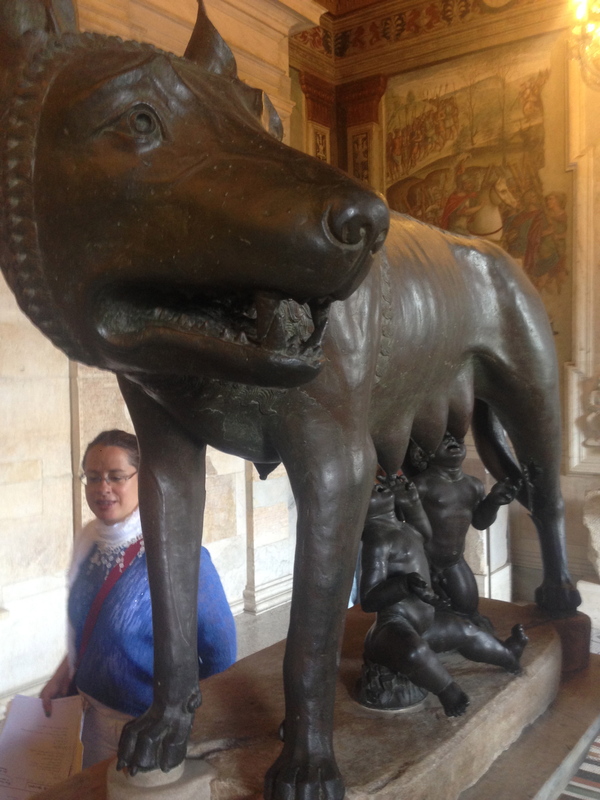 On Wednesday, my class and I went to the Capitoline Museum. One side is full of Roman art and the other is full of Greek art. 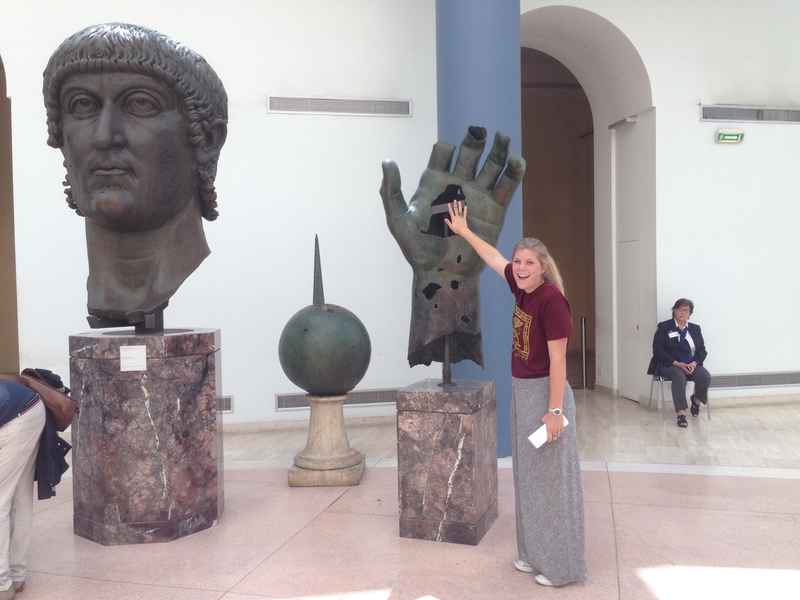 It was pretty neat to see pieces of art that we’ve learned about in class here, and even at MSU, first hand. 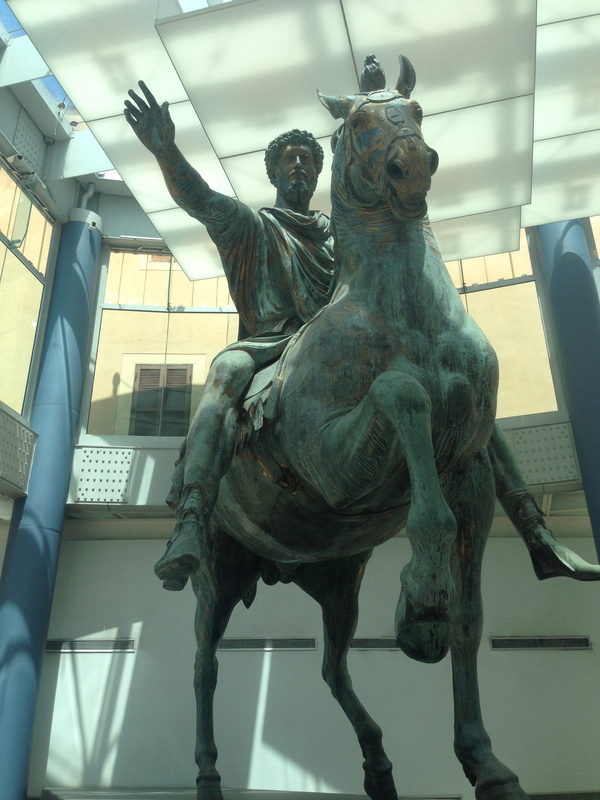 Equestrian Statue of Emperor Marcus Aurelius. Interesting Fact: people used to be hung from the horse’s front leg. High five-ing a colossal Constantine. 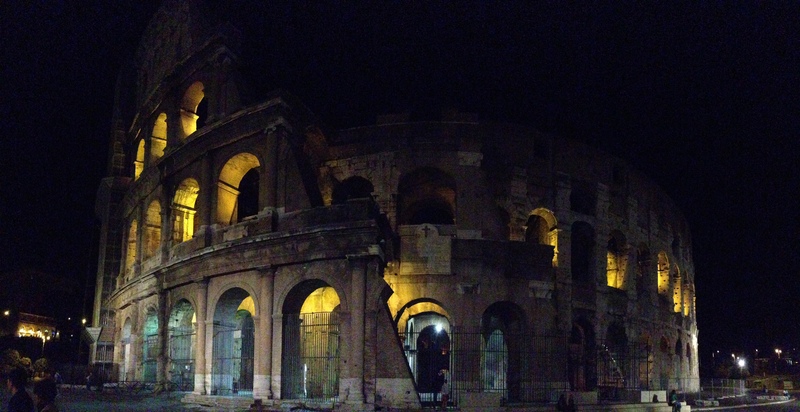 That night a few of us went to see the Colosseum at night and it was beautiful. It’s amazing how things can take on a whole new presentation at night. All of Rome is a new place at night. People are just casually out and eating dinner at ten or eleven. This past weekend I stayed in Rome, for once. I wanted to spend my last weekend here just soaking it all in. I did a lot of just walking around. It’s so humbling to walk around a city so grand. We also did a lot of homework. 😦 Unfortunately we do have exams, but it seems like my teachers have decided to assign more amount of work for our last week here than they have all month. As frustrating as that is, there’s nothing I can do to help it. I still plan to enjoy my final days and try not to stress out too much. 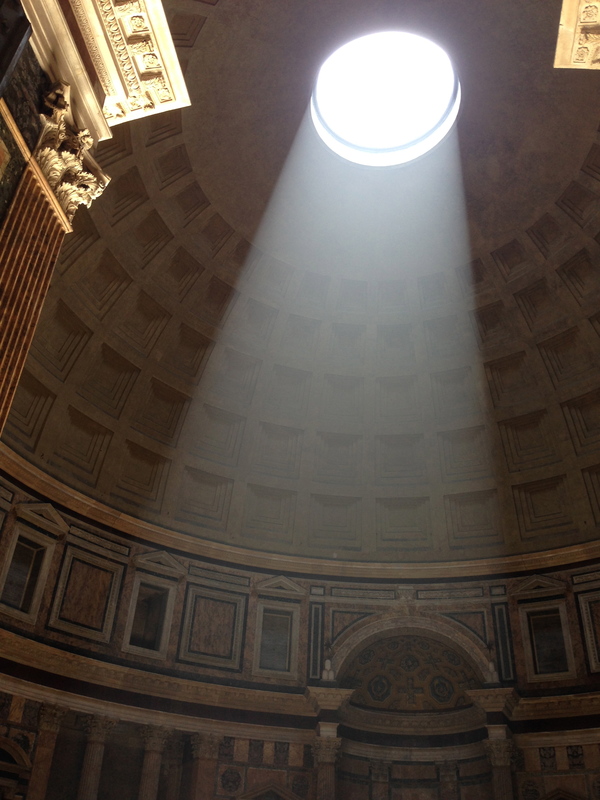 The Pantheon in all it’s glory. I know I say this in probably every post, but I am seriously so thankful for this trip. It has been a wonderful experience and I have to thank my parent for giving me this opportunity. So thanks Mom and Dad! Thanks for trusting me to come here on my own and thanks for being so supportive! I love you both! Off to enjoy my final week as an Italian resident! Bittersweetness. Close your eyes and imagine a fairy tale in Italy. That was my trip to Venice (without the Casanova). Venice is one of the most magical places I’ve ever been. The streets are paved with water and the little waterways are filled with men in stripes steering gondolas (cliché Italy). Accordion music and church bells echo off the water and every where you look looks like a post card. A big reason for that is because they aren’t able to do any modern construction. Because it’s built on a [sinking] island, there’s really no way they could. It’s is so well preserved that it’s like traveling back in time if you can ignore other tourists. This trip was initiated by our drawing teacher. He offered a loose schedule basically saying, “Hey, this is where I’ll be and you’re welcome to join me.” So of course I’m taking full advantage of that. I want every chance I can get to soak up knowledge. On Friday, we stumbled upon Hiroshi Sugimoto’s Glass Tea House. In the Glass House, they person a tea ceremony between a tea master and the tea receiver. It’s a sacred ceremony, but when it’s not a ceremonial area, it’s basically a place for meditation. 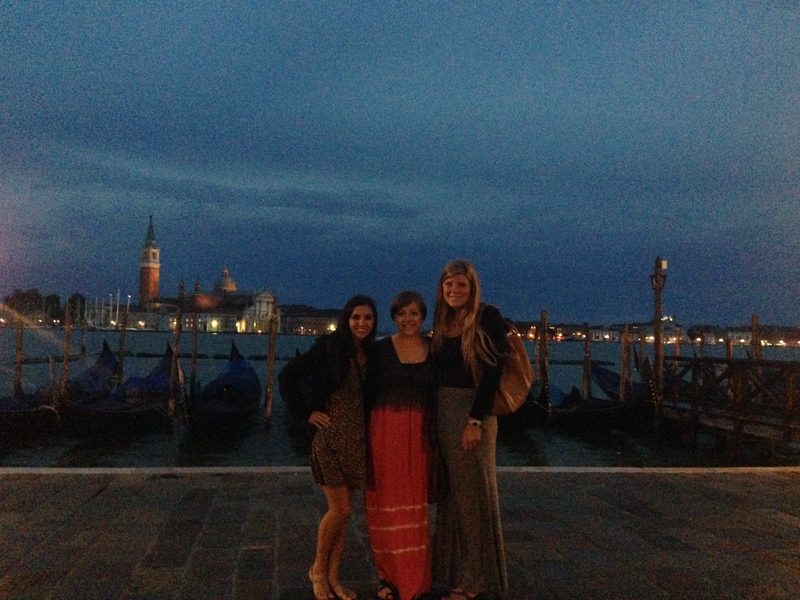 We did a lot of wandering on Friday just trying to soak in the fact we were a all in Venice. We took full advantage of the public transportation called the vaporettos. 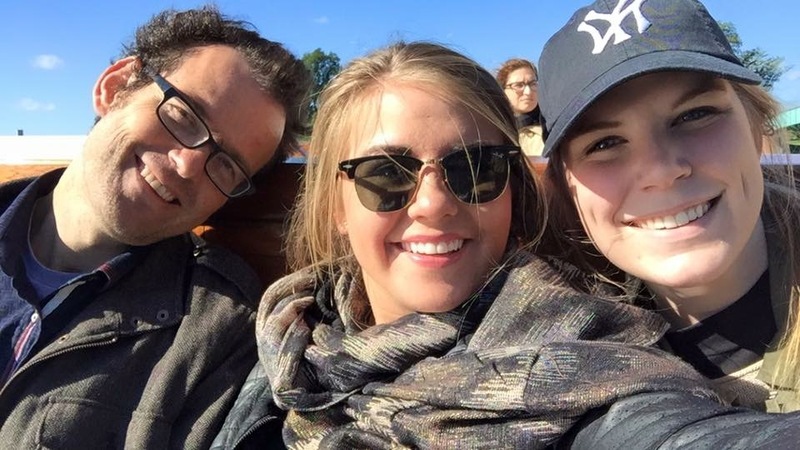 If you get one of the few seats, you can fully enjoy a boat ride through the Grand Canal of Venice, which is a very scenic route. Late that night when we got back to our very posh hostel, we sat outside of it on the edge of the water and did some work in our sketchbooks. The only super awkward about staying in a hostel is if the rest of your people go to sleep before you. Coming in when the lights are off is like walking into church with a wind chime. There’s no way to not make noise, and you feel like you’re disturbing all 13 sleeping women. But it’s still a neater and cheaper way to travel. On Saturday, we hopped on a vaporetto and went to a basilica and an Da Vinci museum, which was pretty cool. They built working models of the sketches in his notebooks. Some of them were interactive, which made it quite interesting. We then had lunch and went to the Acadamia. There are so many HUGE paintings that represent either a bible story, or a story of royalty. After a full day of looking at gorgeous paintings, Zoe, Maura, and I decided it was time to split up with Sam and do some wandering. That night, we went to see the historical play, “Venezia,” at the Teatro san Gallo. It was totally not what we were expecting, but it was really interesting. Before, I had no idea what the history of Venice and the Venetian masks was. But after, oh my did I learn a lot. It is definitely the coolest history lesson I’ve ever had. 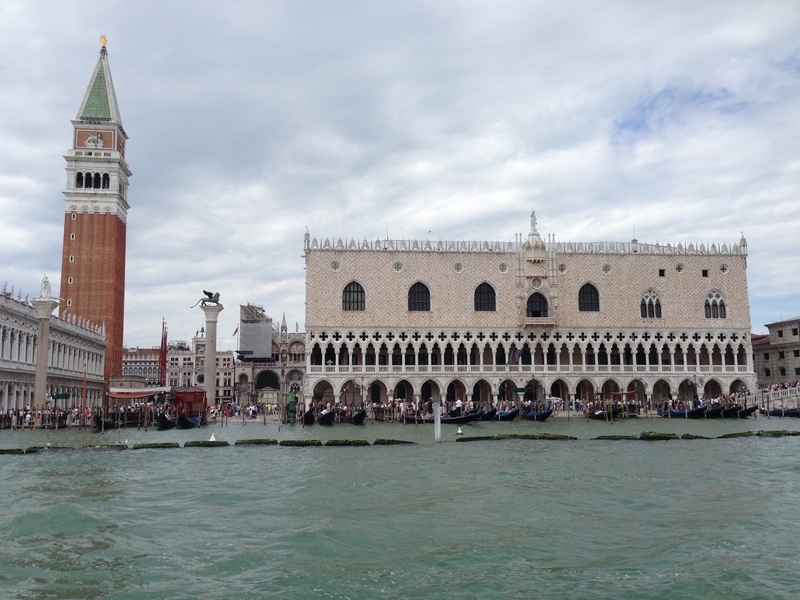 Legend has it that two Alexadrian monks stole Saint Mark’s body brought it to Venice. How exactly masks became a thing is iffy, but basically once people realized the power of secrecy, it was taken advantage of. Masked, a servant could be mistaken for a nobleman—or vice versa. Government and spies could question citizens without fear of their true identity being discovered. The confidence of the people was maintained through the use of masks — with no faces, everyone had voices. Venice became known as the City of Masks, and fell into a lifestyle of luxury, promiscuity, and moral decay. It is such a fascinating part of history. On Sunday, we checked out of our hostel and left our baks at the train station. Then we went to see a more modern art exhibit. This is what drew us in because you can see it from the Grand Canal. It was definitely a refresher to see something that isn’t an elaborate, detailed painting of a dramatic scene. 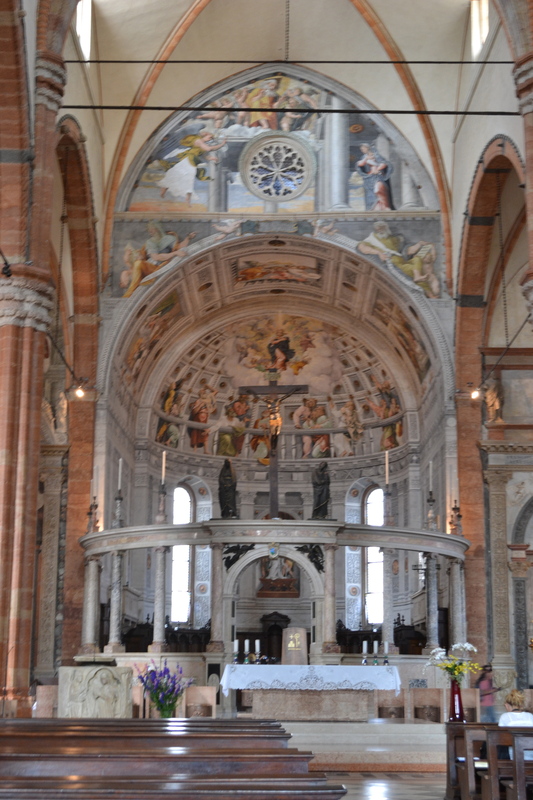 But after that, we went the the Basilica of St. Mark. Instead of paintings, the ceilings are decorated with gorgeous mosaics. After hearing about the history of Venice, it was neat to be able to pick out the ones that represented the story of the stealing of St. Mark’s body. St. Mark’s Basilica from the water. After DAYS of hopelessly craving a milkshake, I am happy to say I finally found one! 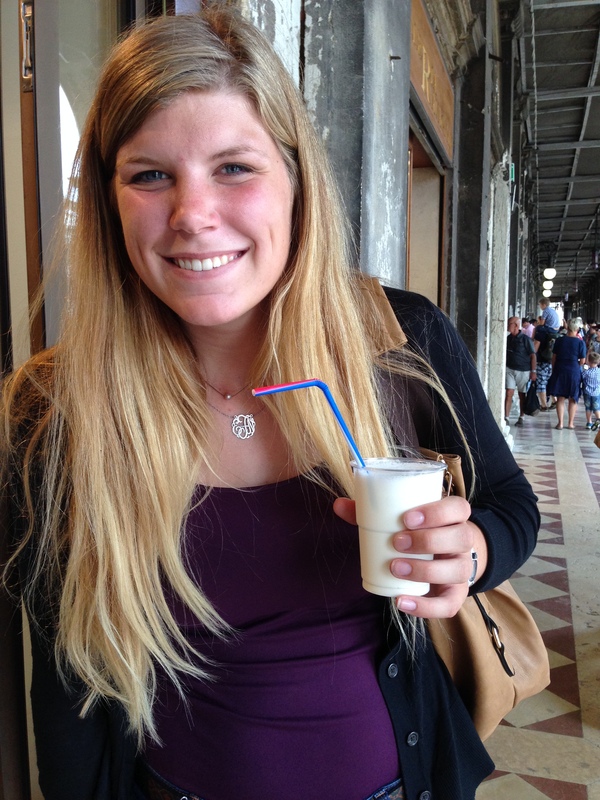 As much as I love gelato, I was dying for a piece of home and I felt like a milkshake was the way to get it. And, boy, did it hit the spot. It was a perfect ending to an amazing weekend. 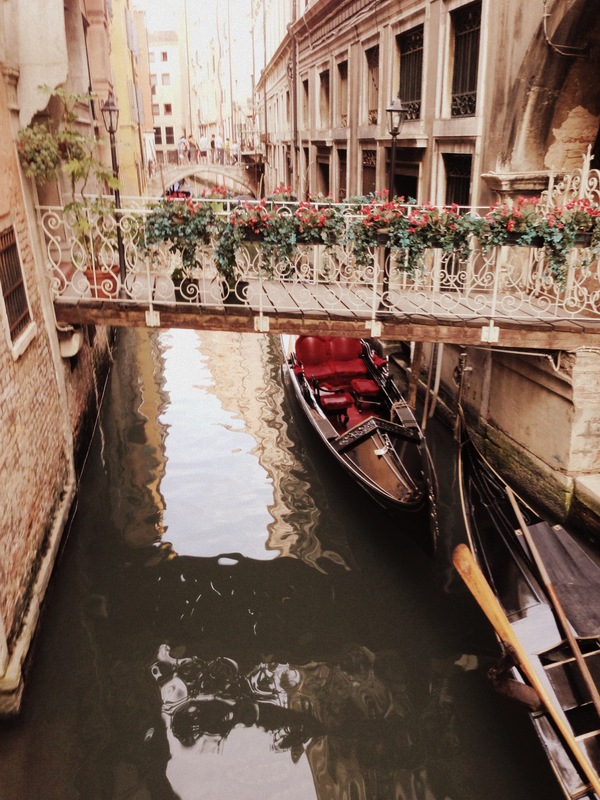 I highly recommend to everyone that visiting Venice should be added to your bucket list! I’m so thankful to have it crossed off of mine. So… that about sums up how I feel right now. It’s been forever since I last blogged. I know. Everything has been moving so fast and we’ve done so much with little time to rest, so this is my best recollection of everything that’s happened. 2. There are traffic laws that people actually follow. 3. More tourists, less locals. 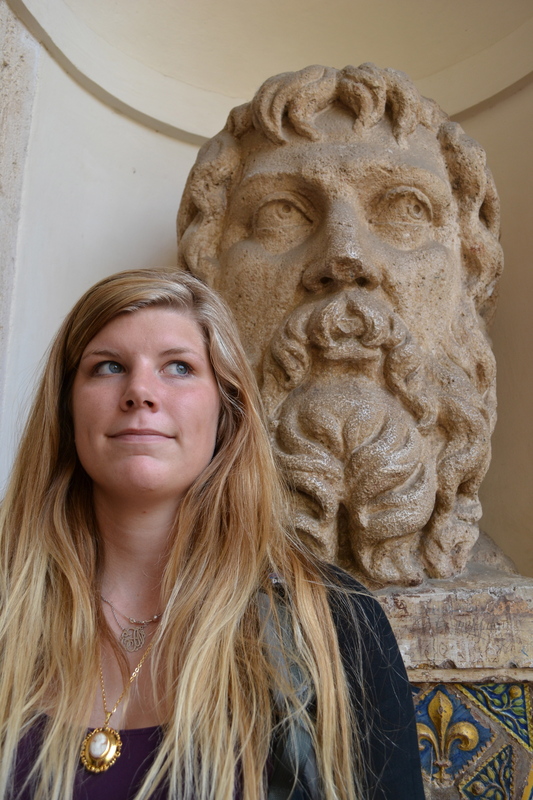 In Rome, locals and tourists are more evenly mixed, but in Florence it is mostly tourists. 4. Because of the rise of the tourists population, there is also a rise in prices. Everything is more expensive, and there are more vendors setting up everywhere. 6. More ART! I feel like the things we’ve seen in Rome is more about architecture. For example, the Colosseum and the Forum (aside from the beautiful ceilings). 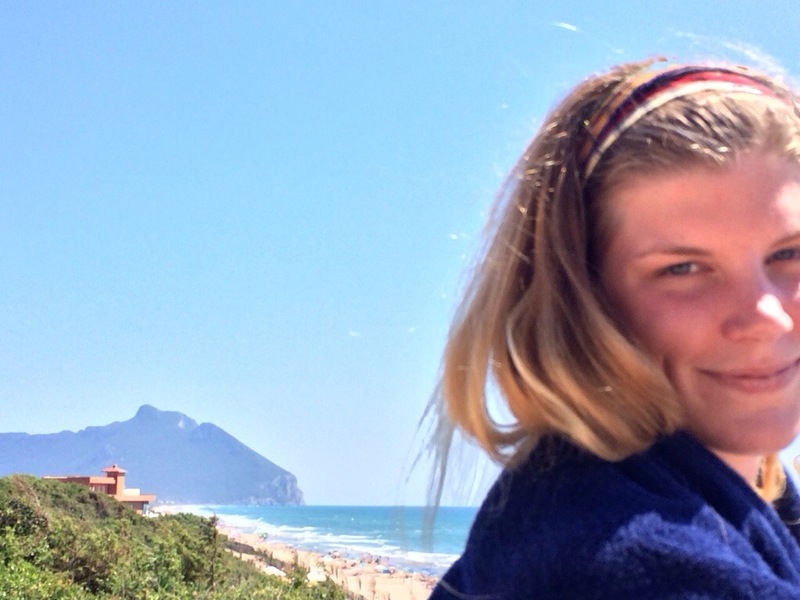 But being in Florence was like being in New York – so many art museums and rich art history. 7. Considering that Florence is famous for the leather, there are leather shops on every block, sometimes five. There are several shops that have bags that are literally handmade, like their workshop is also where you check out. As your browsing, he’s sitting there working on another creation. Which is pretty cool. And several others, but those were the most recognized. After a few hours of admiring the greats, we moved on to the chapel/tomb of the Medecci family. This was the most powerful and wealthy family in Italy. They were so rich that one day the wife decided she was bored with their palace and wanted a new one. So her husband built her a new one. Which is crazy. This was the Palazzo Vecchio (old palace) bell tower that we tried to climb on Friday. Anyways.. Their chapel was the most impressive room I had seen. It was made of complete marble. What made it so different from every other marble room, was one.. It was completely marble. Two, it’s was huge. Three, it was dark green and dark red marble instead of white. Consuela said that this room was even too expensive for this wealthy family to afford. Much of the marble was imported and recycled, and it was thinner than normal. But it was still an amazing room. After that we went to the Galleria de Acadamia to see Michelangelo’s David, his most famous work of art. What makes this sculpture so cool to me is how he is depicting David He has just decided to fight Goliath, but the battle hasn’t taken place yet. He is in a moment between choice and action. That afternoon, after fueling up with lunch, we decided to climb the bell tower of the Florence Cathedral. FOUR HUNDRED AND THIRTEEN steps to the top, and it was so worth it. 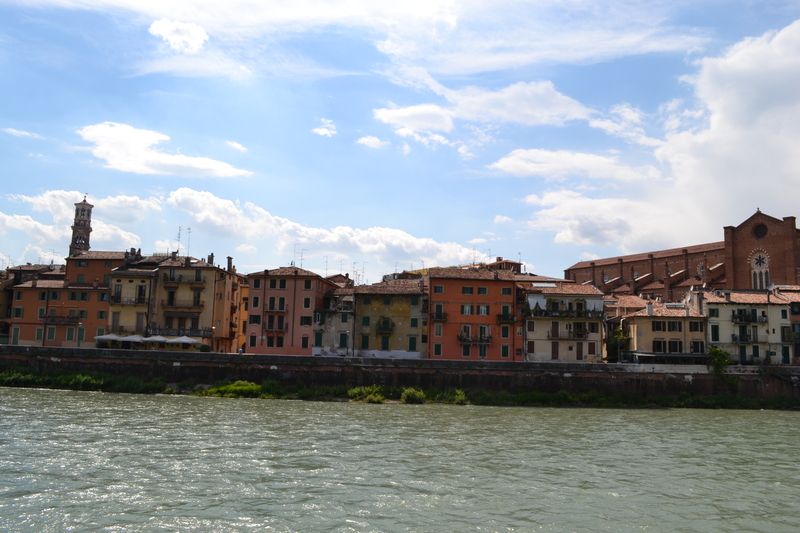 Compared to the view of Verona, there was much more to see. The river winding through the array of domes and rooftops was so scenic. After catching my breath and wiping the sweat from my face, it was time to go back down. My legs were shaking, but I was satisfied. That night we went back to the Palazzo Vecchio to finally climb the bell tower. Two in one day… TWO. We had a few hours to rest our legs between, but we were determined. After only two hundred steps (child’s play) we reached a new height with a new view. After climbing back down, we got to go through the rooms of the Palace. The wealth of this family was extremely eminent in every room we walked in. After finally making it back to the hotel, we were so tired. Climbing two flights of stairs will do that to you. The next day we went to a few museums and then left for the train station. Once we got there, we found out that our trains had not only been delayed, but one of them had ben cancelled. Everyone made it back in one piece, but it was a very stressful situation. Everyone looked so pitiful sitting on the nasty train station floor. Since that weekend, I’ve been trying to recover. We’ve been going non-stop to museums and historical sites. As much as I love it, it’s worn me out. 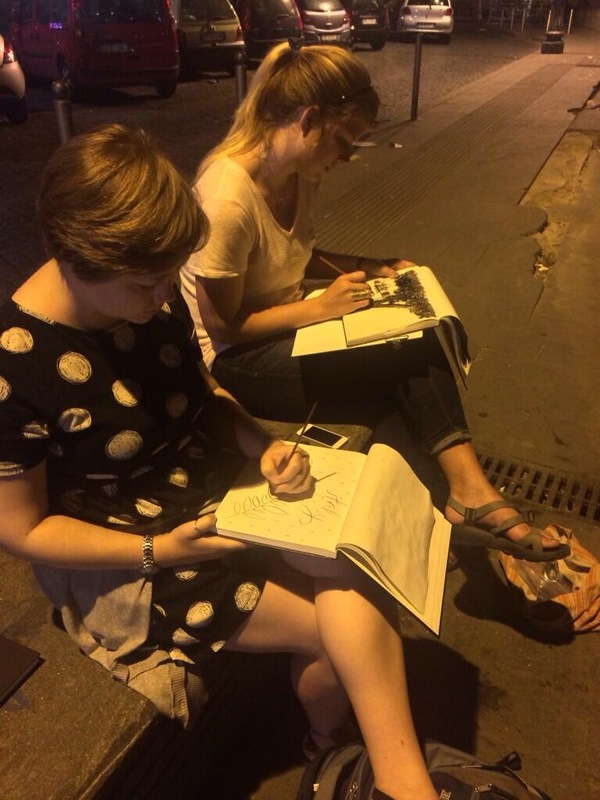 One night, my drawing class got together and walked to a park on a hill that overlooks all of Rome. We brought beer and played music and just enjoyed where we were and the opportunity to sit on a hill and draw the amazing landscape. It was also nice to finally have some relief from the extreme heat. I didn’t realize how much air conditioning made a difference. This whole week has been in the 90’s, which doesn’t seem like a big deal. But when the ONLY relief is when you take a cold shower, it’s miserable. Which is another thing that has worn me out. But the time I’ve spent here has been amazing. It’s hard to believe we’re already halfway through the month. To be honest, I’ve gotten a little homesick at times. This probably has a lot to do with the fact that I speak no Italian, but even the simple task of grocery shopping was difficult. I have no idea what I end up with. For a little over a week I was washing my clothes with fabric softener if that tells you anything. But other than small frustrations, Italy is great. I’ll be sure to not check out for so long next time. I’m off to rest and pack for Venice this weekend! Words can’t describe how much I love being an art major. The feeling of being able to sit on a hill and draw such a beautiful/significant piece of history leaves me speechless. Art is not all about learning how to draw, it’s about different ways to perceive the world. Opening your mind to new perspectives. Today, sitting on a hill overlooking the Roman Forum and drawing the landscape was just so surreal. I could hear an accordion playing music from the streets below and it just couldn’t have been more cliché Italy. Yet it was so perfect. Our teacher told us to focus on the different layers. This meaning not only the different layers of the landscape, but also the different layers of history we’re trying to capture in our sketch. For example, I drew the Roman Forum, more modern apartment buildings, and then tents that had been set up for yesterday’s parade. It was confusing to begin with, and I chose a spot in the sun which was stupid, but everyone in our class is really good and came out with some very beautiful sketches. I believe that somewhere in their sub-conscience, everyone deliberately chooses what, where, and how they draw. I always love to see other people’s drawing styles and perspective. It’s like how athletes will go to camps or watch team’s film. They’re trying to pick up new tips and tricks to expand and grow in how they play. It’s essentially the same thing for artists, until you become Picasso, or Michael Jordan, and you’re already amazing. So basically my first day of class was a success. For dinner tonight, Jordan and I were getting tired of eating out and tired of cooking pasta, so we decided to try something different. We went to the grocery store with no idea what we were getting and came out with onions, zucchini, mushrooms, and pre-cooked cordon blue. We had the hardest time trying to figure out how to light the gas oven without blowing ourselves up, so we just decided to use the gas stove. It all came out extremely delicious! From 1:30 to 4:30 Italians have a thing called a “siesta period.” All stores close during this period to allow people to take an afternoon nap. This is definitely a tradition America should adopt. At first I didn’t understand it, but after being here for almost a week, I never miss a 2:30 siesta. Italians walk basically everywhere. Rome is a lot like New York in that aspect, except there are no skyscrapers to block the sun. So not only are we walking everywhere, the sun is also extremely hot. So by 2:30, I’m worn out. And when I miss this lovely time, I always regret it. Sometimes we move too fast in America and don’t just enjoy the moment. Italians will sit for hours at a meal just because, whats the rush? And, of course, the siesta period. I love their way of life, and also the nap time. Tomorrow is my first day at the Rome Center for my Art History class. I’m excited to learn more about what I walk past every day. I’m off to eat more gelato! 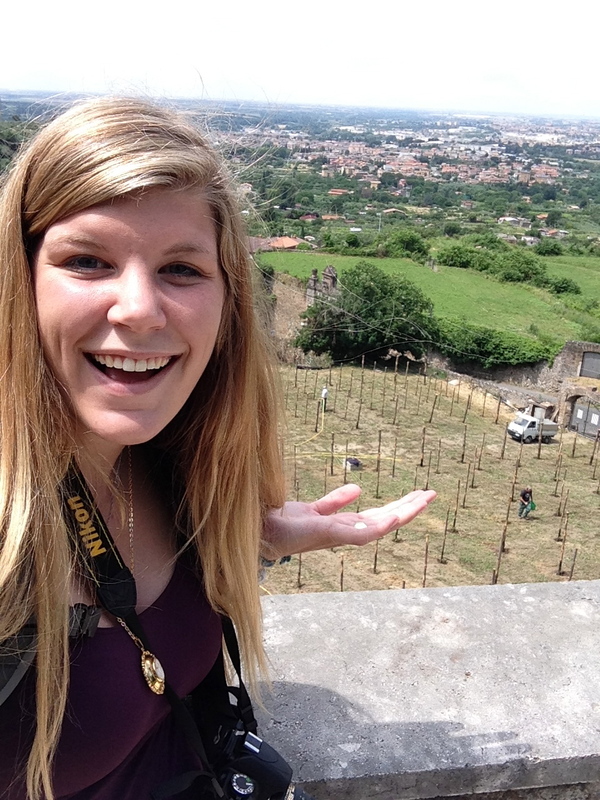 Yesterday, Amanda and I made the long journey to, you guessed it, Verona. It was absolutely gorgeous! (There I go again wearing words out) We bought our tickets the night before and then woke up early to catch the 8:15 train. Without getting lost we took a bus and found our platform early, even. After a three hour train ride, we walked out of the station and into Verona. Verona is a beautiful city. 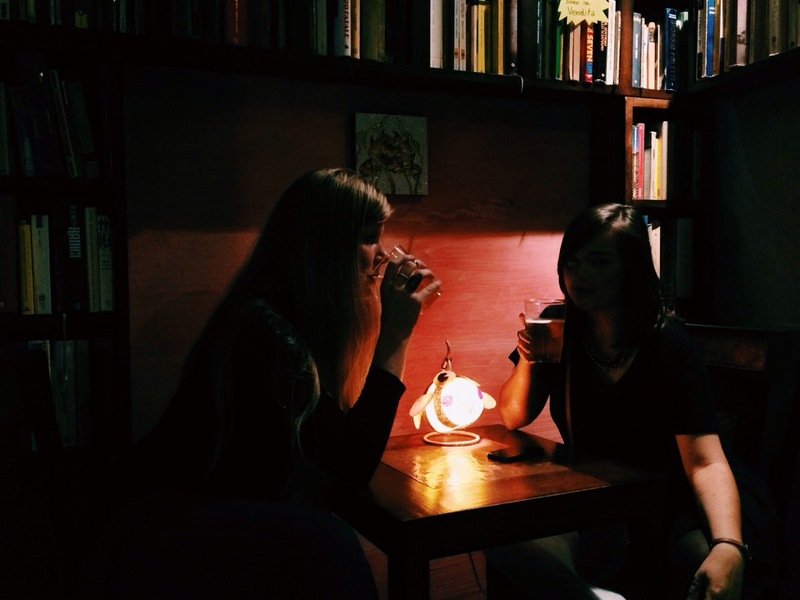 It is full of history, great food, and the cute skinny alleyways that make a great postcard. First we found our way to the center of the city where the Arena is located and had some lunch. 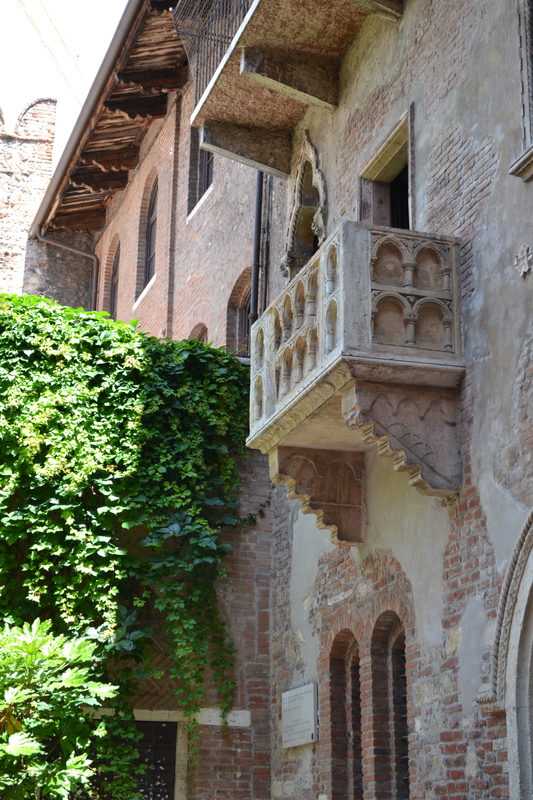 The first thing on my list was to see the Balcone di Guilietta (Juliets balcony!). Of course it wasn’t really her house, but whatever. It was to cutest thing. When you walk into the gates, there are two walls that face each other and are covered with names of lovers. It looked super cool. Also, couples will write their names on locks and lock it to a gate. 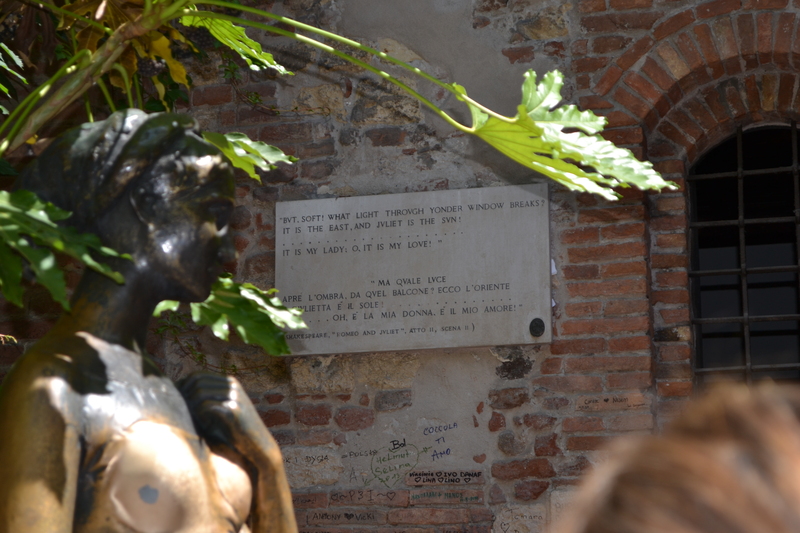 Once we finally made our way out of the courtyard, we wandered the streets of Verona until we came across the Duomo, or the Cathedral of Verona. Another absolutely beautiful church. I’m amazed at how much time must have been spent on this, or on any extensive fresco paintings. It takes me long enough to complete a 16″ x 24″ still life. I can’t imagine doing a whole room. After wandering a little bit longer, we stumbled upon a museum of modern art. It was in the same building as the tallest bell tower in Verona. It was THREE HUNDRED AND SIXTY EIGHT steps to the top and I climbed every single one of them. I was dying but it was so worth it once I got to the top. After a long day of wandering around, our feet were killing us and it was time to head back to the train station. Once again, we easily found our way. However, after the three hour train ride back to Rome, the trip from the station to our apartment was not so easy. We waited for our bus for thirty minutes. Several came in and out, but none that would take us to where we needed to go. So we decided to try our luck with the metro. We stood there for several minutes looking at a map when finally some Australians sensed our struggle. They told us the correct train that would get us close, and then even gave us their day passes. We were so thankful for some help that we didn’t need subtitles to understand. 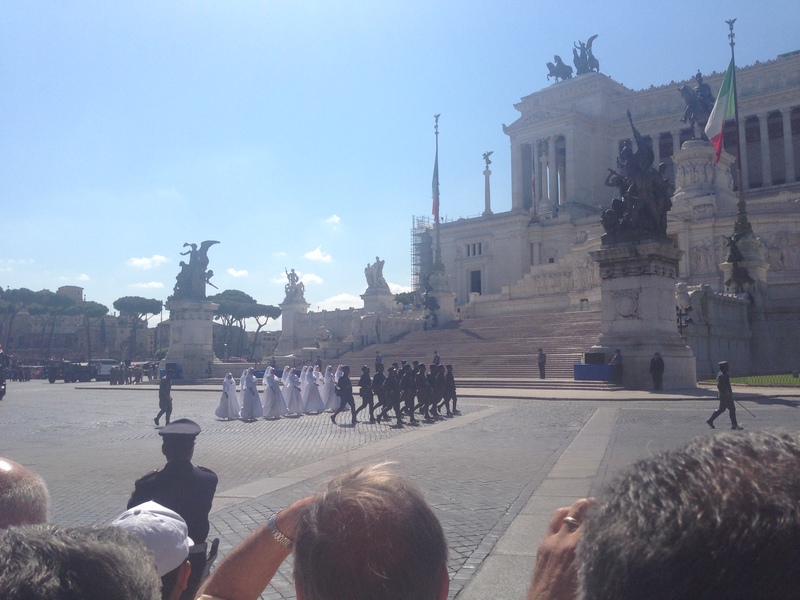 June 2, 2014 – The 68th anniversary of the Republic of Italy. Or also known in Italy as the Festa della Repubblica. In 1946, the people voted to abolish the monarch and become a republic. It was such a great experience to be able to be a part of the festivities. 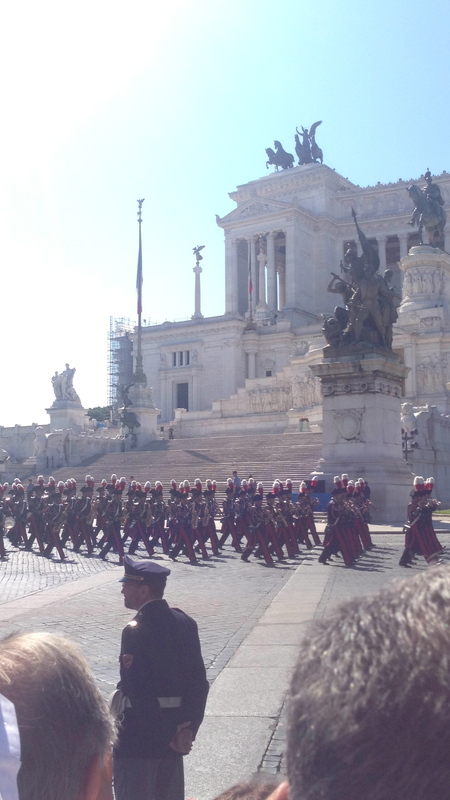 They had a military parade which I was able to go to. It was cool to watch the parade, but it was also cool to watch the people. Italians are very proud to be Italian. Standing in a crowd of people there were cheers all around when a section of the parade walked by. 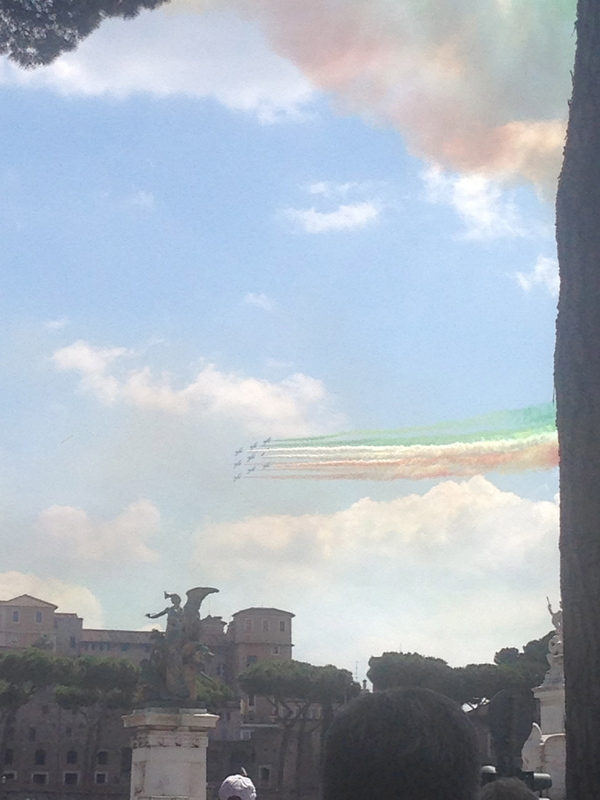 “Viva Italia!” was heard all around me and it was such a great experience to be in the middle it. I’m so used to a parade being a glamourous row of floats and cars and, need I say it, tractors. But this was all military and marching bands, which were also military. Because it’s what I’m used to, I kept waiting for the fancy cars. Or something big and extravagant at the end, but I only knew it was over when people crowded the streets. I was standing in front of the Alter della Patria (Alter of the Fatherland). Whenever the military groups would pass in front of the monument, they would look, or sometimes salute, as they walked by (without getting out of synch of course). After the parade, I came back to the apartment and took a much needed nap. Then the girls in our apartment and a few of the friends we’ve made came over and we cooked dinner and drank wine. We had bread, olives, and cheese for appetizers, and then pasta for dinner. It was such a cute little dinner, and such a fun way to end the day. Oh yeah and of course more gelato. So, I wrote this last night and it never uploaded, so I apologize in advance for the double post today. Only three days in Italy and I’ve already fallen on my face. That took longer than I thought it would, especially with all the stairs. Don’t get me wrong I’ve had plenty of close calls, but this morning as I was running back into my room in a rush, I completely face planted through the doorway. I’m not sure how it happened, but there is still a mark on the floor from my shoe. I just laid there trying to process what just happened while my roommates were cracking up. But I’m sure it was absolutely hilarious to watch. So that’s how my day started. But despite a clumsy morning, the rest of the day was absolutely perfect. But before we started the day – and I’m sure you can guess what’s coming next – we stopped for some fresh fruit. 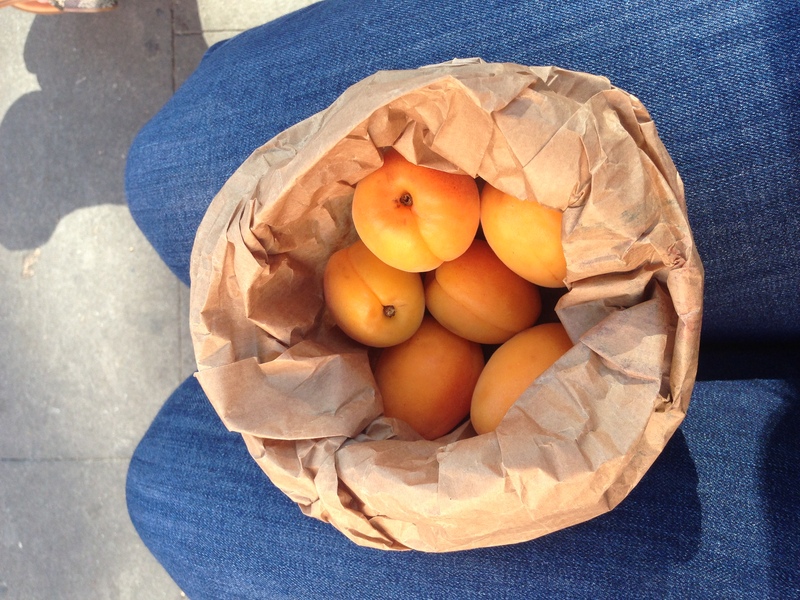 Today I had apricots. Once again, I wasn’t disappointed. When the men selling the fruit see us coming, they wave and say, “Just one?” The first day we bought fruit, I think it caught them off guard when we only bought one banana or one pear. They’re used to people coming to buy a bag of goodies. But they got a huge kick out of it. And now they remember us either for that reason, or because we’re a group of Americans that don’t really know what’s going on. Either way, we eat delicious fruit. Today we took a bus to Tivoli to go to Hadrian’s Villa and the Villa d’Este. After getting off the bus, we took a short break for coffee. 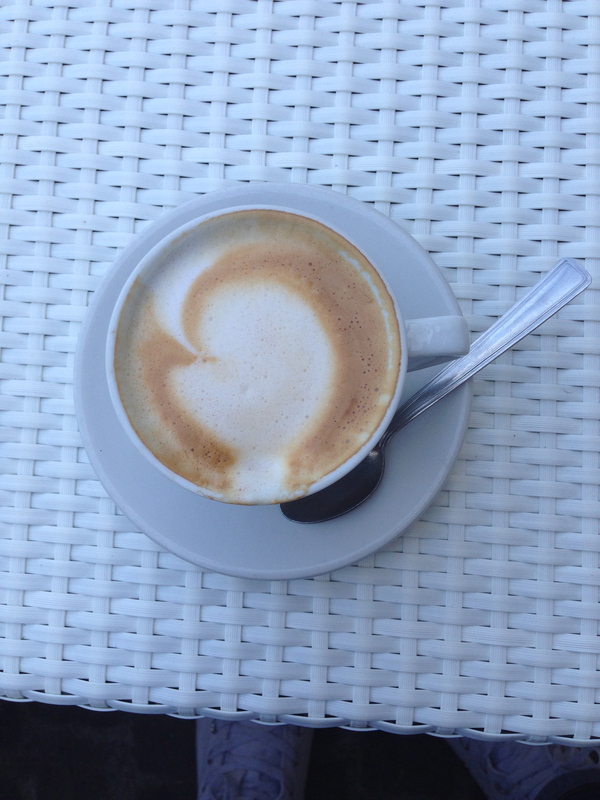 I had my first cappuccino and it was too good. 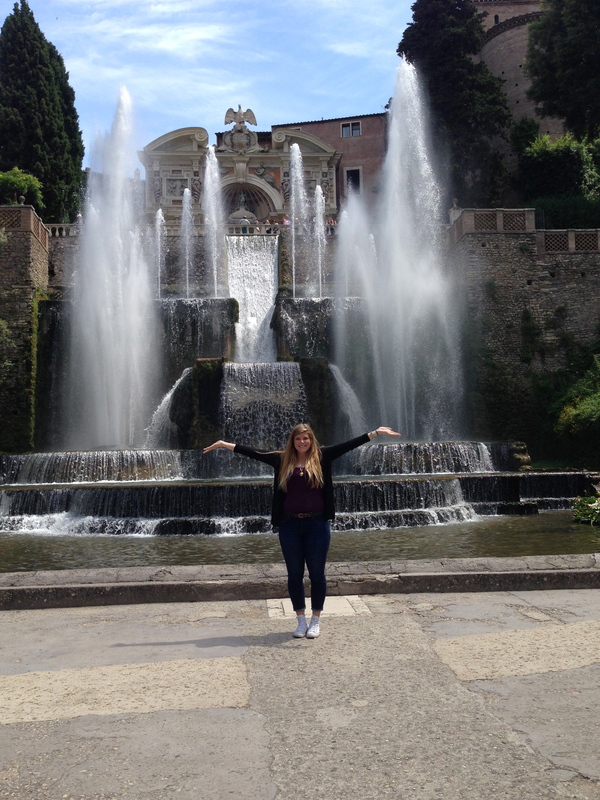 I just realized most of the pictures I do have up are of food… Anyways back to the Villa d’Este. Before going in, the drawing students met with our teacher and he told us a little bit of the art history in the area and told us things to think about as we were wandering around. The Tivoli area was where the concept of landscape art originated. Artists didn’t have a precious idea of the landscape so they would look out the window as they were painting on the wall. That was neat because as we were looking at the paintings in the Villa, you could look out the window and see what they saw, what inspired the artwork that was in front of me, and it was overwhelming. Sometimes I do this thing where I get so overwhelmed with joy and just emotions in general that I tear up. It’s weird I know and I don’t really know why it happens, but as I was standing there with the ability to put myself in the artists’ perspective, oh boy, did it happen. 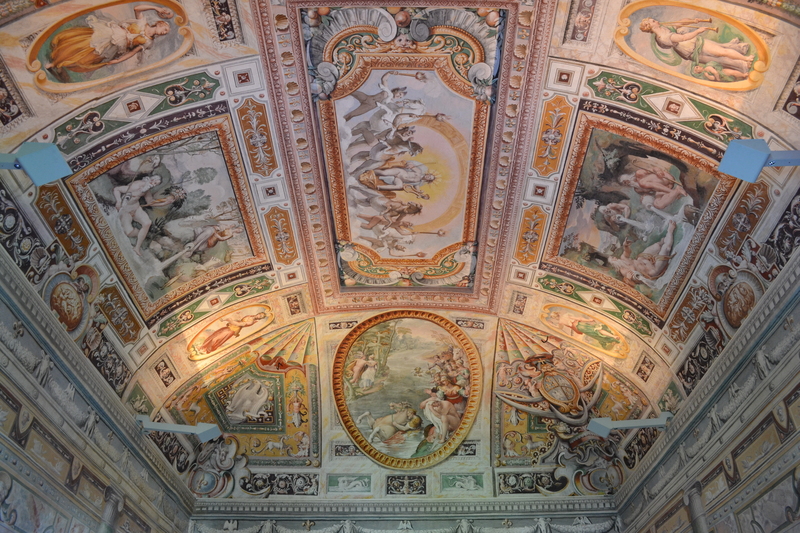 Just an example of what every ceiling looked like. 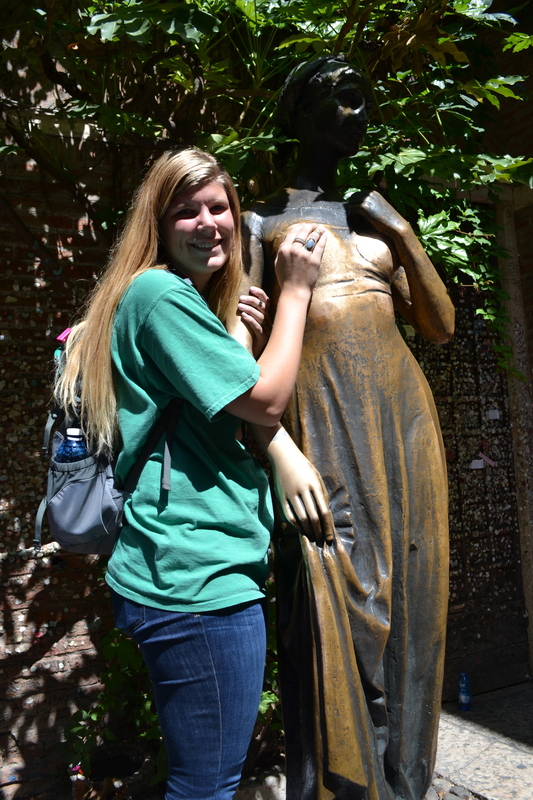 Not only were there beautiful paintings, there was also a beautiful garden. It was amazing. 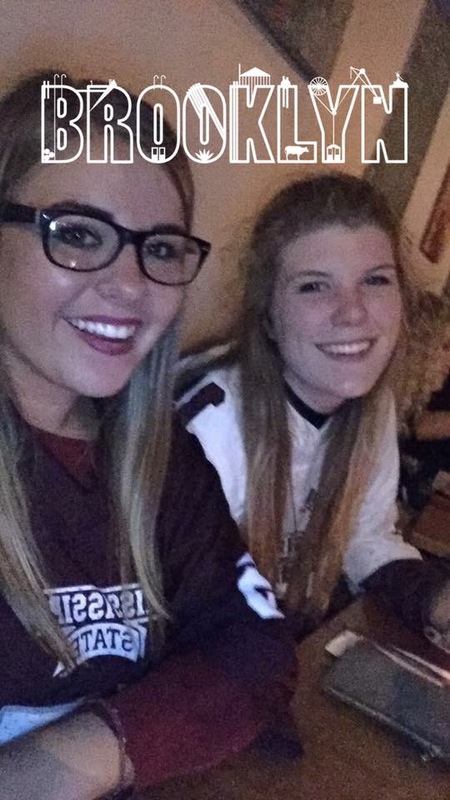 Maura, one of the six from Mississippi, and I both noticed that we were wearing that word out. Amazing, beautiful, awesome, and every other name in the book to describe this place doesn’t hold the same meaning as before because we used them so much. Yet there were no other words to describe what we were trying to process. 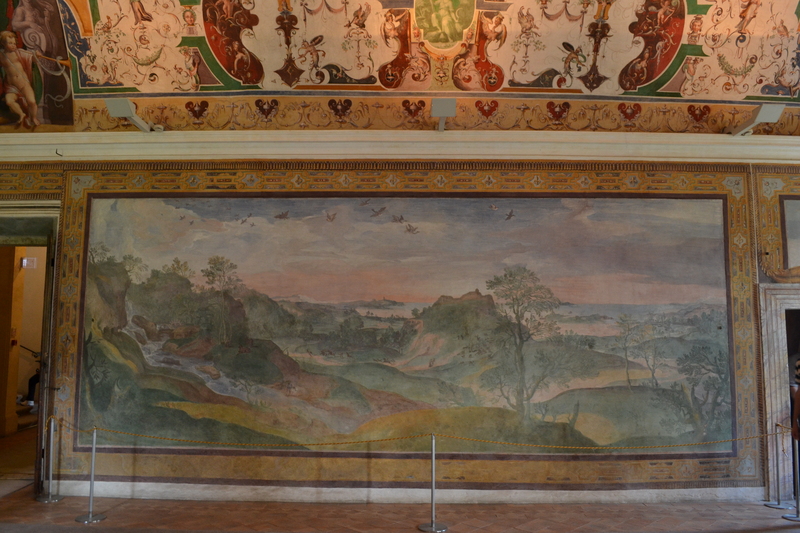 The Villa was on top of a mountain, so when you stood on the open side, you could see all of Rome. Also, my teacher told us to think about the concept of our place in the world. Are humans and architecture separated from the natural world, or are we a part of its beauty? It is argued both ways, but it all comes down to how you perceive the earth’s beauty. As I was standing there, looking out onto the rooftops of Rome, I knew what my answer was. After spending a few hours wandering and taking pictures (which will be uploaded eventually), we left for lunch. We ate at the cutest little restaurant! The waiter was a joyous Italian man and the food was delicious. Then, of course, more gelato. But then as we were gathering to go to Hadrian’s Villa, the sky began to get dark. Then soon after the wind began to blow hard. It sprinkled, but never really rained. However, that cut our time in Tivoli short and we weren’t able to go to Hadrian’s. After getting back to the apartment, we went back to the grocery store. It was another experience, let me tell ya. Buying laundry detergent was the MOST confusing thing ever. 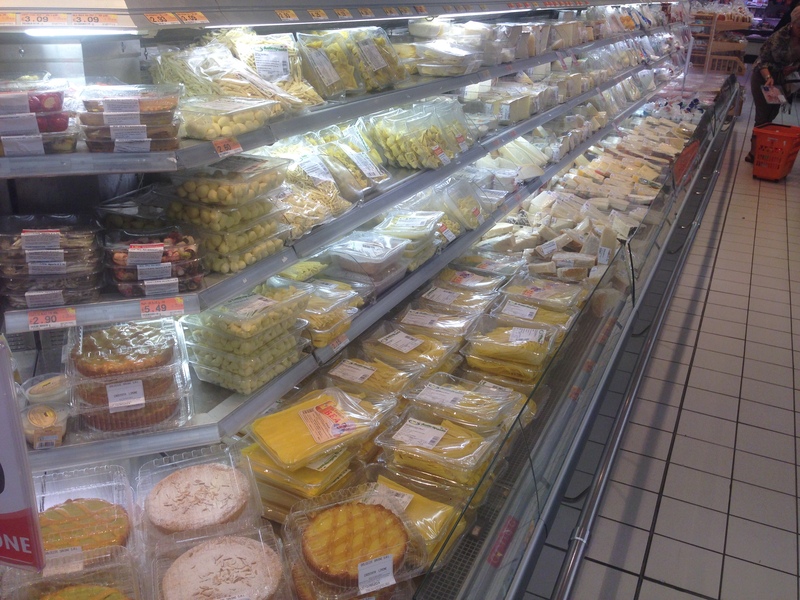 Also, the amount of fresh cheese and wine they have is insane. Definitely more than I’ve ever seen in one place. After buying the essentials (wine, cheese, and toilet paper), we went back to our apartment and cooked dinner. 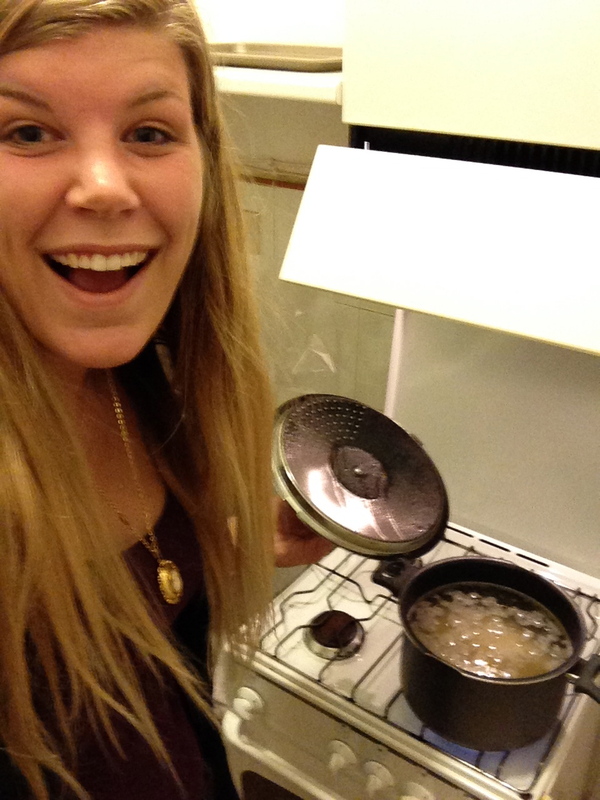 On our tiny stove, I made some yummy pasta. I didn’t burn anything/anyone so that was a positive. It didn’t taste too bad either. Then as we ate, we watched, or more so analyzed, the Lizzie Mcguire movie. 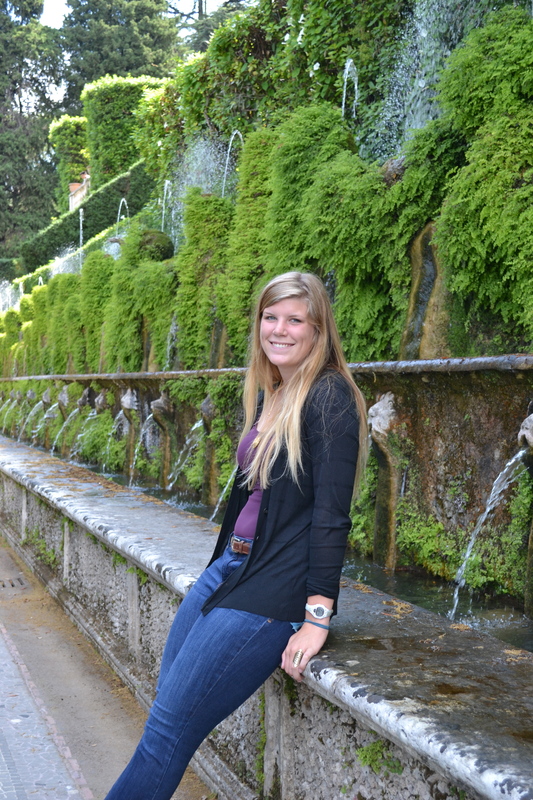 She went to Rome by herself for two weeks the summer before she went to high school. That means she was probably thirteen. That’s like my little brother, Baylor, going to Rome for two weeks. I’m about to be a junior in college and I’m just now doing that. Needless to say, after figuring that out, it was harder to enjoy now compared to when I was eight years old. But anyways.. today was amazing, from start to finish. Tomorrow is our first free day and Amanda and I are going to Verona! Romeo and Juliet, here I come!